The Centre for Technology Infusion provides world class facilities to students, industry and researchers so that their ideas can be brought to life. We are partners in national and international research and development programs. The Micro/Nanotechnology Realisation Facility (formerly known as the Product Realisation Centre) provides hardware developers access to the latest technologies and development tools to bring their ideas to life. The Centre is a partner in the Melbourne Nanofabrication Centre and the $15 million National Networked TeleTest Facility, which provides leading edge capabilities addressing the most complex testing, IP validation and characterisation challenges in micro/nano electronic and System-on-a-Chip. Designers can also access the National Networked TeleTest Facility(NNTTF). engage in strategic and applied research. access to the latest technologies from Saphicon, Peregrine, IBM, ST, TSMC, etc. The La Trobe University Microsoft Centre is a technology infusion initiative between Microsoft and La Trobe University and is supported by the State Government of Victoria and other technology providers. The Centre is a facility for software developers (including subject matter experts, the developer community, university students and staff) where their ideas can be brought to life through the infusion of cutting edge hardware and software. This facility is aimed at creating better links between students and business as well as lowering the infrastructure barriers and ensuring that the latest platforms are available to software developers for research and product development. The facilities and activities in the Centre are closely aligned to the Microsoft platform that in turn will contribute to economic growth through development and transfer of technology, new IP and relevant world class skills transfer. global visibility and access to an audience of potential investors, clients and partners. You can join BizSpark if you are a privately held company building a software-based product or service (even using open source code), in business for fewer than three years, and with less than US $1M in annual revenue. To join, you must be sponsored by a BizSpark Network Partner. You can apply to join BizSpark through the Centre for Technology Infusion by submitting our online enrolment form. We will then send you an enrolment link. No payment or credit card information is required, and there are no upfront costs. Microsoft will assess a US $100 program offering fee at the end of participation in the program, or the end of three years, whichever comes first. The National Networked TeleTest Facility for Integrated Systems (NNTTF) is a $15 million facility providing fabless companies and design houses with engineering, pre-production test and characterisation services. The facility operates as a virtual centre spanning Australia and is accessible internationally. It consists of the facility node at ECU in Perth and 5 remote nodes. 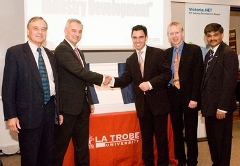 The Centre for Technology Infusion at La Trobe University is the NNTTF node in Victoria, Australia.NNTTF is accessible through the web with leading edge capabilities addressing the most complex testing and IP validation challenges such as mixed-signal and high-end digital integrated circuit (IC) technologies as well as other emerging technologies. The Melbourne Centre for Nanofabrication (MCN) is the Victorian node of the Australian National Fabrication Facility (ANFF). MCN is a collaborative initiative between La Trobe University, Monash University, The University of Melbourne, Swinburne University, Deakin University, RMIT University, the Victorian State government, the Commonwealth government and the CSIRO. MCN's ultimate purpose is to fill the gap in Australia for open access, multi-scale, multi-disciplinary nanofabrication infrastructure. MCN's goal is to support and produce research and prototype advances in areas that include environmental sensors, medical diagnostics, micro and nano actuators, novel energy sources (e.g. solar cells) and novel bio-nanotechnology products like drug delivery devices.The central MCN facility is based at a new, purpose-built facility, adjacent to the Australian Synchrotron. Approximately half of the central facility's research space consists of clean rooms (class 100 and 10,000) and the other half is occupied by biochemical laboratories.